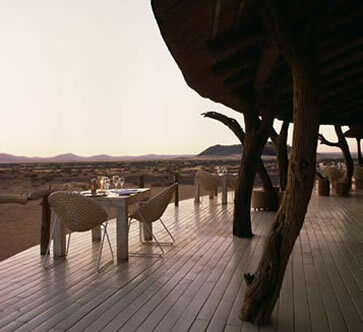 From its slightly elevated position, Little Kulala discreetly observes the ebb and flow of life in Sossusvlei�s sea of dunes and sand, its organic character and rustic design wholly congruous with its remarkable surroundings. 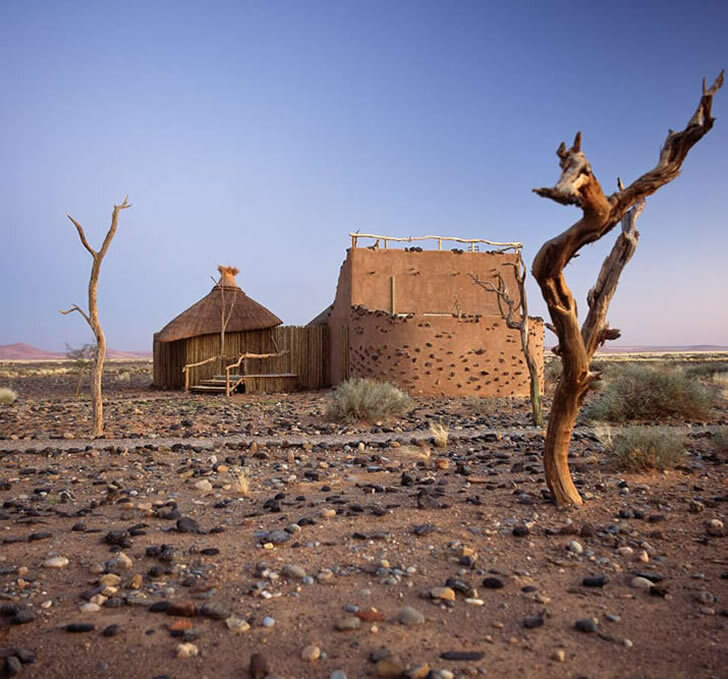 So extraordinary is the location of Little Kulala in Namibia�s Sossusvlei area that it might well have been art-directed by a set designer tasked with creating a primeval landscape on an unfamiliar if earth-like planet. Never-ending swathes of chalk-coloured sand segue into coral-red dunes, which in turn stretch into the Naukluft mountain range with its wide plateaus and deep canyons forged by ancient rainfalls. Nearby, the dry Auab riverbed winds its way to nowhere, flanked by preserved camel thorn trees that remain forever fixed in place like fossilised sentries. Though painterly because of its surreal quality, this is a landscape that is also remarkably alive, and its dramatic sunrises and sunsets tint the earth in shades from dusty pastels to fiery crimson. Awe-inspiring creatures as large as the regal oryx and as small as the toktokkie beetle roam the terrain, all adapted for survival in the harshest conditions. Even the delicate appearance of the indigenous grasses belies their ability to flourish through several seasons without water. Occasionally rain does fall; then the desert blooms briefly with a kaleidoscopic spectrum of flowers and plants. 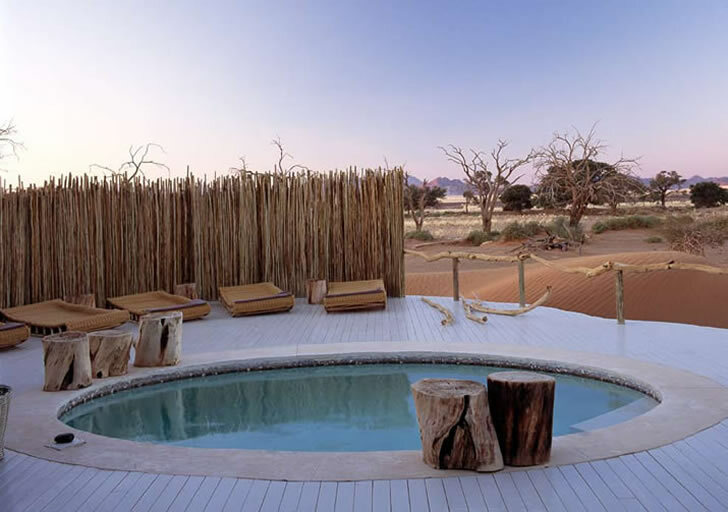 A strong connection with nature is further suggested in the choice of principal materials � all sourced in Namibia. 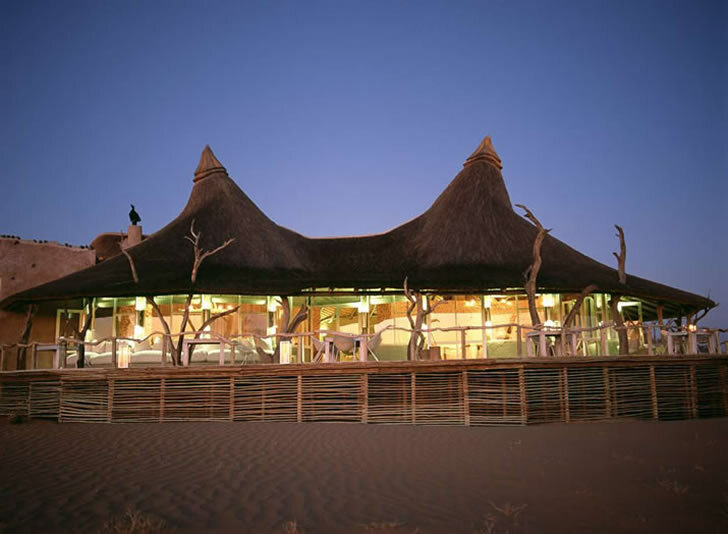 Walls were built using white cement and dune sand, which provides both texture and colour, while thatch was selected for its organic appearance as well as insulating qualities. 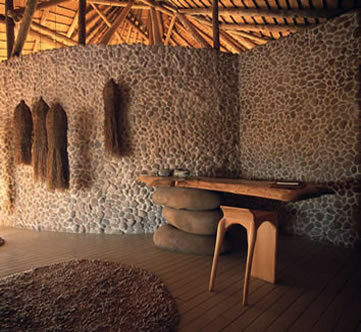 Rather than opting for a slick geometric form, Chase designed the roof to take on an unrefined, slightly off-kilter look and introduced support pillars made of gnarled tree trunks � some of which �grow� through the thatch � to further enhance the textural, rustic nature of the structure, as do the internal curved walls in the lodge�s public areas. Of course, being located in a desert, practical requirements also determined some of the design choices, such as the ultra-deep wrap-around balcony of the main lodge, which provides shady respite from the unrelenting sun during the day. The deck is also used after dark for al fresco dining, the stars providing ethereal illumination. When not utilising the public spaces, guests make themselves at home in one of 11 luxuriously appointed canvas and thatch villas, each with an expansive bleached wooden deck fitted with a plunge pool. Designer Laurie Owen created the welcoming look of Little Kulala�s interior, an earthy organic style brushed by romantic and contemporary elements. Evidence of her overriding design inspiration � the Deadvlei region in the middle of the Sossusvlei with its dry, sun-baked character � is manifested in a colour palette consisting of bleached bone, mud and the faintest hints of silver and washed-out green. The furniture, much of it bespoke, is as curvaceous and undulating as the dunes outside: for example, the low-level pebble-like coffee tables, felt �seed pod� floor cushions and ottomans (by textile artist Ron�l Jordaan) and shapely mohair-covered loungers. Textures too are of the earth. Wool, felt, mohair, knotted leather, hand-dyed linens, raffia, roughly hewn wood, handmade beads, clay, paint (a traditional blend of sand and natural pigments) and handcarved sandstone are all tangible references to the distinctive beauty of the immediate environment. 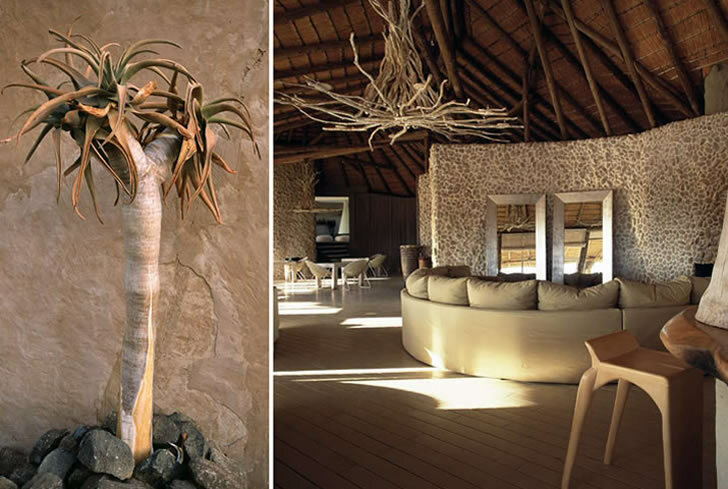 The organic connection goes deeper than mere aesthetics: many of the functional and decorative objects also have an ecofriendly bent, such as the fabrics utilised throughout, which have been coloured using only natural vegetable dyes; the recycled handblown glass vessels in the dining area; wooden floating shelves, furniture and light fittings (including the eye-catching twig chandelier in the main lodge) fashioned from alien plant species; and Zulu Mama chairs by South African designer Haldane Martin in the dining and lounge areas, which are made using recycled plastic. �The mood and feel of this lodge is cool, serene, cocooning and slightly surreal,� Laurie Owen says. �It�s a slice of heaven in the middle of the desert.� �Kulala� means �the place where you rest or stay� in Oshiwambo, and one of the undisputed highlights of staying here is sleeping on the roof of your villa, which can be accessed via an internal staircase. With the rest of the world a million miles away and the stars in the inky southern sky shining bright, you�ll quickly understand what she means. Heaven is indeed a place on earth.